W.G. 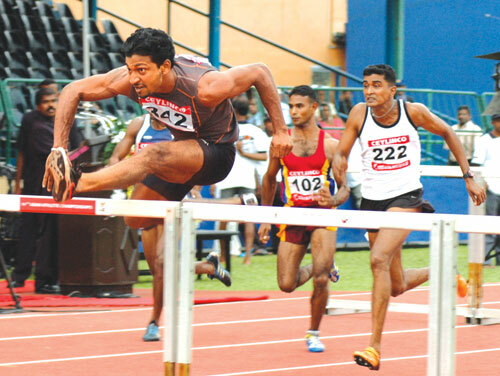 Nuwan Tharanga (Southern Province) going over the final hurdle to win the gold medal in the men’s 110m hurdles. The Western Province team with a huge total of 220 points, retained the President's Trophy and the overall title at the 33rd National Sports Festival organized by the Ministry of Sports and Recreation which concluded at the Sugathadasa Stadium in Colombo yesterday. Uva Province soccerites defeated North Western Province two goals to nil on Monday. This victory also gave them a soccer double at the 33rd National Sports Festival. Prior to this game Uva women soccerites beat Central Province also with the same margin. Menaka Wickramasinghe won the gold medal, running in the 400m at the ongoing World Military Games in Hyderabad. Menaka representing the Sri Lanka Defence Services team clocked 52.93 seconds to win the event. Why not send Algama to Australia?